Winston Churchill has been described as one of the greatest war-time leaders of the world. 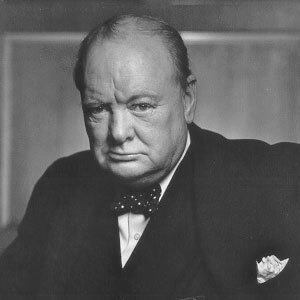 His leadership of Britain during the dark days of 1939-45 was pivotal in the outcome of World War 2. (For more on this see The Importance of Right Attitude Part 2). He was a fiery orator, recognised as the man who refused to submit to tyranny and through whom first a nation and then the world found strength to resist and ultimately prevail. But behind this great persona and larger than life character was a man who also suffered through his life with depression. In the early part of the 20th century, Violet Asquith describes her first meeting with Churchill that captures both his depression and his strength in dealing with it. It may well be that those hard even bitter comments were a foretaste of the resolute determination and perseverance that was going to be so important during the dark days of World War 2. What I take from these observations are that the difficult experiences of our lives can be part of who we become and enormously valuable at different stages of our lives. What are your reflections on these insights from Churchill? It would be great to have your thoughts and comments.